We open with Lagoon Boy being blasted by some kind of laser blast through the torso, in the forest. We then cut to Wally West/Flash lying on his bed talking to his son that no longer exists in this reality, as he holds one of the Golden Masks to his face. We then see the familiar face of Booster Gold, approaching the front door of Sanctuary that is disguised as a mid-western farmhouse. He is greeted by three individuals that run the place, that bear a striking resemblance to Ma and Pa Kent and Lana Lang. We again go back to the forest where Lagoon Boy was seen being blasted, as he gets up from the blast, and says, "again," only to be blasted back down once more. Wally is then seen in a room that artificially mimics surroundings to his desire, as he tells it what he wants to see, from his old backyard to his wife and children. In the meantime, Booster is getting a rundown of how Sanctuary works, and is told he can choose to wear the robes and mask, should he want to conceal his identity whilst he is there. Lagoon Boy tires of running the same scenario over and over again, and decides to call it a day, while Wally is having the time of his life with his kids and wife at his side. We see Roy Harper with his daughter, as he tries to be the best father he can possibly be for her, which is again a simulation run by Sanctuary. Lagoon Boy on his way back discovers the bodies of others that resided at Sanctuary, all dead, and before he can react, he is impaled by a sharp projectile, in a similar fashion to that of the laser blast. Before he dies, he starts to laugh. Everyone is startled at the sudden alert by Sanctuary, as they are all told to proceed to the nearest exit. In typical Flash manner, Wally is the first to reach the scene, only to find Roy Harper, one of his best friends and fellow Titan, dead at the front door. He is then struck on the back of his head by a big wooden mallet by Harley Quinn. Booster witnesses this, as Harley tells him "she didn't know he was there", to which he replies "It's my first day". Story - 5: I wasn't too thrilled with the last issue, and I'm happy that this one has managed to recapture my interest. There was so much to "unpack" with this issue, it made writing the review so hard, as I didn't want to miss anything out, which I surely did do, so please forgive me. As per the synopsis, this issue is our "prelude" episode to the events that transpired in issue #1. We get to see how most of everyone was murdered at Sanctuary, yet still speculate who the actual murderer actually is. King managed to do a wonderful job, of showing us the turmoil that our heroes were going through, particularly those that have lost so much to reality warping and then realigning, and the somewhat bad decisions of Dan Didio and co. (sorry that was a cheap shot I know). Wally West's longing for his family that no longer exists was actually quite gut wrenching, and then seeing one of his best friends lying dead at a place that was dedicated to heal and be safe, only added to the sorrow of a hero that has lost so much... Then he is killed by Harley with a mallet, while Booster watches. This is classic Tom King, bringing about a range of emotion, and ending it in the most unconventional way. Do not get me wrong, I'm not complaining about the why, I'm just shocked at the how. Wally met his end, not by a cosmic event, a fancy mechanical weapon or any of his own rogues gallery, but a fatal hit to the head when he least expected it from a weapon they had in the dark ages. I guess I still don't know how to feel about this. As a fan, you never want to see your heroes die, and want them to forever be fighting the never ending battle, and as a company, DC needs to keep the universe fresh and vital for new and old readers alike. Seeing as how we only got Wally back after so many years, it feels like it was a waste almost. However, as always, my policy is that we should wait until the end of the story to make a judgement call. Along with Wally we get a touching scene with Roy and his daughter Lian, and also Lagoon Boy trying to get over the trauma of being shot by a laser blast. I loved that he goes through the same trauma as a way of getting over the event that haunts him. The explanation through exposition from Booster was great, regarding how the mechanics of Sanctuary work. Though I am a little tired of the Kryptonian Sunstone Technology, I like King's use of it, to make hard-light construct and the sort to help those that hard being treated at Sanctuary. Coupled with Batman's tech, I have a theory that Sanctuary itself may have found some sort of sentience, much like Brother Eye back during Infinite Crisis. Which is one aspect I love about this series so far, as to how it has me speculating, because when you speculate, you're engaged, and if you're engaged, you are therefore having fun. For that I take my hat off to Mr King. King also through the same exposition gave us the purpose of the Golden Masks and White Robes worn by some at Sanctuary, as a means of anonymity, for those that wish to wear it. Though not the case for someone like Booster, I loved that he chose to talk to a Sanctuary rep, that was guised as himself. Meaning that Booster's issues are more with himself than anything else, I loved this part, and how it can also be used against him, as Harley stated in the first issue, that she saw Booster kill everyone at Sanctuary. What an awesome plot device. All in all, I have found myself fully immersed in the story, so King is doing a good job in keeping the interest for this high. We got to see the events leading to the first issue unfold here, so here's hoping that the pacing remains the same throughout the rest of this series. Art - 5: I've said in the past how much I hate when an artist changes during a run or a storyline, as it can get quite jarring and also likened it to actors changing from episode to episode of a TV show. I still stand by that statement fully, and would normally knock down a grade in regards to the overall art... However, editorial must be commended here, as they found an artist in Lee Weeks that managed to capture the very same tone that Clay Mann rendered this book in. This is not to say that lee Weeks "cloned" Mann's style, no sir, he still managed to do it in his very distinct and very illustrious style, that packs in emotion and action all at once. Weeks managed to capture the sombre and dark tone of the series thus far, which goes a long way in keeping consistency in the story. Maybe to the casual fan with an untrained eye, you would not be able to tell that there are two different artists in this book, which is why I loved Lee Weeks work here. Also would like to add that Tomeu Morey's colors also play a large role in this, but more on that later. Clay Mann did draw the interview panels for this issue, so was a nice touch seeing the difference and similarities in both artists work, in one issue. The scene of Wally rushing to Roy's aid, and realizing he is too late, hit me the hardest. I think that Weeks managed to capture the friendship and more importantly the brotherly love these two had with one another. And to discover one of your best friends lying there murdered, well let's just say that if this were a movie, that actor would be up for an award for sure. The Lagoon Boy death was also another one that hit hard, as we saw poor L'gaan hit in the exact same fashion as he was trying to get over, with the laser blasts. Booster Gold was also portrayed to perfection, as he made you laugh, during his personal anguish. Again, Weeks managed to nail this performance down. Love that Sanctuary is modeled after the Kent farm house (from the DCEU films), and that the caretakers resemble Jonathon, Martha and Lana. Nice artistic touch. And lastly Wally with his family was an absolute joy to behold. Weeks managed to show the joy in his face when he was reunited with his family that no longer exists. The colors are very tame, but not quite muted. They do emphasis the colorful world of the DCU, but don't saturate it with vividness like other books in the DCU. Tomeu Morey manages to continue doing a wonderful job with his palette, as well as tie the series together with the different artists. Cover Art - 5: I like the composition of this main cover very much. 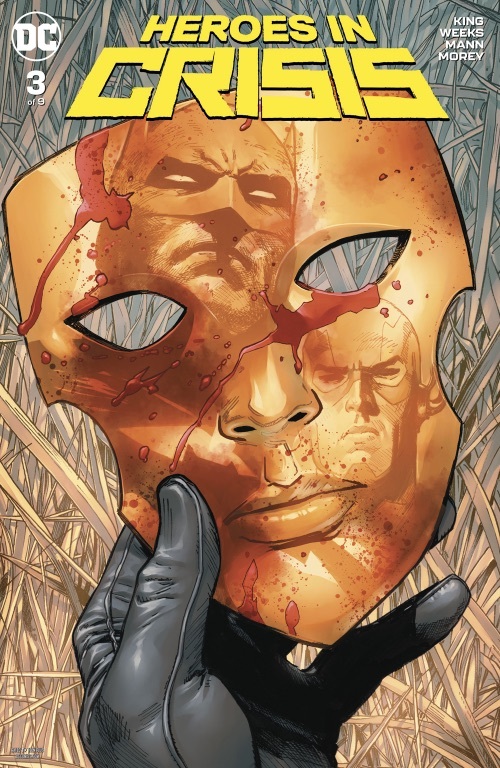 Now that we know what the masks represent, it makes more sense. Also love the reflection of the Flash along with Batman in the mask. Variant Cover Art - 5: First we had the Death of Superman case file cover, followed by the "Breaking of the Bat". 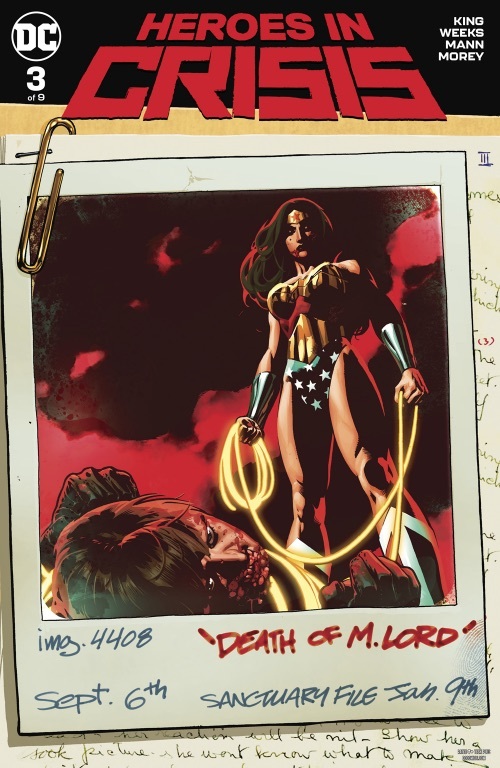 This month we get the "breaking of Max Lord" by Wonder Woman. A wonderful call back to major pre-flashpoint events, it's just sad that this is what Wonder Woman's most defeated moment is, rather than when she died, back in the 90s. Check out the Comic Index Lists for the complete list of Superman-related comics published in 2019.